The latest poker scanner camera has been launched to the market, the flash ultrahigh speed scanner camera. Good tools are prerequisite to the successful execution of a job. 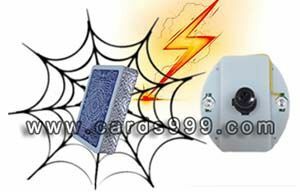 The best playing cards scanner, is the good poker cheating device for Texas Holdem and Omaha analyzer system. The flash playing cards scanner use high technology, to install a ultra high speed camera in a real clothes button, and work with a normal shirt. Other people cannot realize and find it. Many people have used the other cameras, such as lighter camera, car key scanner, mobile phone scanning camera, double clothes button scanner camera, and so on. For this kind of cameras, they have a common feature, you need to place the barcode marked cards well, you need to make sure that the analyzer marked playing cards can be read by the poker cheating cameras. However, for many situations, incidents will occur, poker players cannot handle the whole poker games, so sometimes even you take the poker analyzer, scanner camera, QR code marked deck, also cannot get the perfect result. The flash poker scanner can solve all the problems above. When the barcode playing cards go through this latest camera, no matter how you move, just 0.1 second, it will scan the barcode of marked cards poker, and transfer the signal to the poker analyzer. 2 different distance are available, 6-14cm, 20-40cm. You can choose the suitable distance according to your requirement. It uses a small remote control to turn on/turn off the playing cards scanner, to save the battery. According to this, the battery can use long time. In addition, no matter what analyzers you have, MDA and V68 old texas holdem scanner system, CVK poker scanner detector, AKK poker winner predictor, all are sit for the flash ultrahigh speed scanner camera, to make perfect work with texas holdem and omaha scanning system.